In the context of the ITU Green Standards Week, the UNEP Secretariat of the Basel, Rotterdam and Stockholm Conventions together with ITU, UNU, and CEDARE is organizing on 16 September 2013 a one-day Forum on Environmentally Sound Management of E-waste. 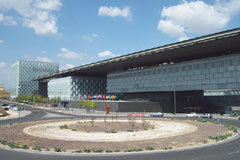 The Green Standards Week is organized by ITU from 16 to 20 September 2013 in Madrid, Spain. Hosted by Telefónica, it will bring together leading specialists in the field, from top policy-makers to engineers, designers, planners, government officials, regulators, standards experts and others. The main purpose of the E-waste Forum is to discuss the quantification and qualification of the e-waste challenge, the role of policies, standards and regulations and best practices for designing e-waste management systems. Download the Green Standards Week brochure.